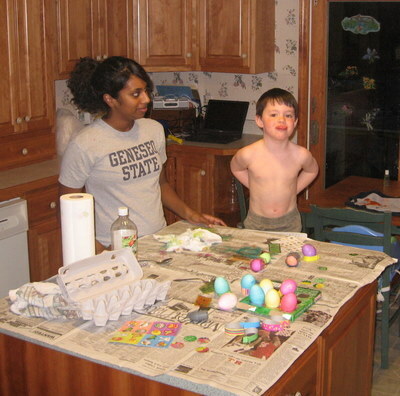 Wednesday night Jennifer came over to play with Eric and make Easter eggs. Friday night we went to the last of the Floyd Fire Department fish fries with Skip, Steve and Linda. 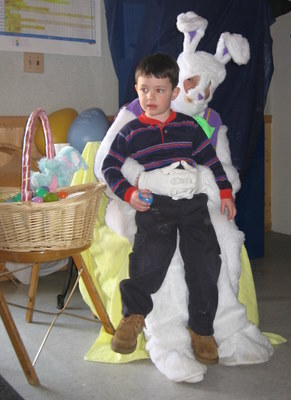 Saturday Eric and his buddy Trevor went to the VFW sponsored Easter egg hunt with a scary looking Easter rabbit. 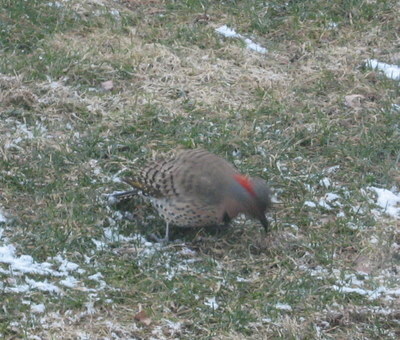 Saturday afternoon I went to the ADK Mountain Club Iroquois Chapter Open House. Most of it was pretty tame, but I bought a book, chatted with a couple of members and especially had a good conversation with Bill Ingersoll on possible and planned canoe trips. 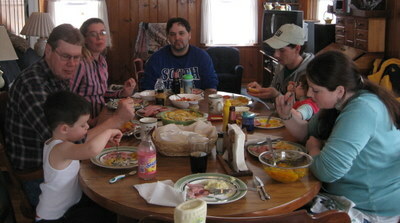 Later Saturday afternoon we had Ed & family, Billie Jo & family for Easter dinner. Clockwise from lower left, Eric, Jim, Kelly, Ed, Billy, Dakota, and Billie Jo. Not in picture Kathryn and Izzabella. On Easter Sunday we went to church and then to dinner with Mom, Robert and others. 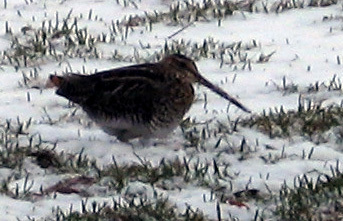 Upon our return home late afternoon we watched the common snipes and flickers foraging on our lawn.